In the Western imagination, Vitaly Mansky’s Close Relations represents a uniquely neutral view of the Ukrainian crisis. In a climate of mutual demonization between Ukraine and Russia, and perhaps more pertinently, between Russia and the West, Mansky’s portrait of a divided country at war has provided foreign observers with rare views of both Western and Eastern Ukraine beyond the fault lines while acknowledging the pull of power and propaganda. The fact that Mansky is originally from Ukraine, with family scattered around the whole country, has allowed him to tell the story of his native land as that of a family disunited, capturing what seem to be the views of actual people with real lives rather than media fabrications. Close Relations has been lauded for bridging political divides, debunking myths about East and West, and fostering understanding, earning Mansky – among other prizes – the Crossing Europe Social Awareness Award of the Linz Film Festival, and many a positive review from journalists presumably yearning for a more balanced coverage of the crisis.1 Of course, neither prizes nor accolades constitute proper consolation for either Mansky’s family, or for the director himself, who – fearing reprisals – has definitely left Russia, where he had resided until the completion of the film. But they do indicate how we have come to understand (and reward) objectivity, and where we set its bar. Even at face value, Close Relations seems like an odd fit for serving as a bar for objectivity. Is it plausible to assume that a filmmaker can make an objective documentary about his family and country at war? Doesn’t the very premise of the film sound like a formula for a highly subjective docu-essay? It is true that, while Close Relations is inherently subjective in the sense that it deals with the director’s own family, it does not wear its subjectivity on its sleeve. On the contrary, Mansky lingers in the off during most of the film’s running time, appearing in front of the camera only when it was deemed necessary.2 While we know and indeed never forget that the family we are dealing with is Mansky’s, who keeps interjecting through questions directed at his family members, and through a recurrent voice-over that helps us identify them, the director’s persona is that of an observer. What Mansky presents himself as coming to terms with is not his personal fate, nor even his family’s fate, but that of his native country. One could thus say it is Mansky’s professed aim to present a balanced account of the Ukrainian crisis rather than a docu-essay. We as the viewers are not presented with Mansky’s arguments about the crisis (although the director occasionally hurls one at his family members from the off), but with vignettes of a family and country divided by war. In this sense, the film’s pretense is not even contingent on it really dealing with Mansky’s family rather than any other family thus separated by political developments. But of course, it does deal with the director’s family, which raises the question if the film can really live up to its reputation of building a bridge between East and West. Mansky certainly conveys the impression that it can. Even when the director speaks to his mother in Lviv (Western Ukraine), where the film’s journey through Ukraine begins, the information he demands from her feels oddly out of touch with his own persona. As Mansky’s mother explains to Vitaly that their ancestors moved to Ukraine from Lithuania, and that they were in fact Poles, he inquires, repeatedly, how Lithuanian Poles could become Ukrainians all of a sudden, as if he were referring to someone else’s family history. But the “close relation” does shine through in their conversations (“kin” would in fact have been a more accurate translation of the original title). When Mansky’s mother grows tired of Vitaly’s incessant inquiries concerning the armed conflict in the Donbass, she sighs, calmly stating that “it’s all very complicated”. She reacts with equally calm tenacity to Vitaly’s frustration at their complex family history, and to his calls to arms, as does a parent unperturbed by her child’s stubbornness. 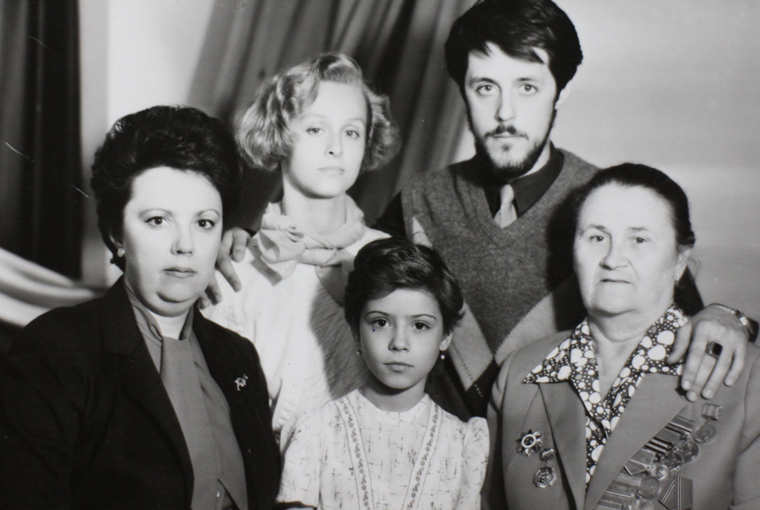 Following this short conversation regarding Ukraine and the family’s history, Mansky wants to document – presumably as evidence of the momentous time in Ukraine’s history – the first time that his mother is going to vote in years. But the symbolic image is forfeited when it turns out that Mansky’s mother turned up at the wrong election office, and that she does not feel like taking the bus two stops further down to cast her ballot. “Do you need me to go?,” she asks Vitaly, reinforcing the impression that the conflict’s politics are much more important to him and his film than they are to his mother. (Whenever Vitaly does manage to press her on the conflict, she speaks of peace, not of power.) The fact that Mansky includes such shots of him and his characters breaking the fourth wall, makes it especially curious that he would try to position himself outside of the frame. Did Mansky really think he could subtract his own subjectivity from a film about his family? Not all sequences make that question sound rhetorical. The next stop of Mansky’s journey is Odessa (Central Ukraine), a picturesque city on the shore of the Black Sea. Although Mansky is here to visit his sister’s family, he mostly speaks to her husband, with whom he appears to be on good terms, though not quite on the familial ones conjured by the original title. This does not necessarily play into Mansky’s portrait of a country marked by war, though. In Odessa, too, the people Mansky spoke to are not as keen on talking about politics as he may have wished (is that the reason why the camera keeps returning to the political ads on TV?). When two workers visit his brother-in-law to take up a forestalled renovation, one of them asks why one should fight, when it’s much better to work. While Mansky’s mother may not have been genuinely complicit in the film, she did play along – which could hardly be expected of the workers, or Vitaly’s nephew even, who exclaims with confidence that he will obviously not be joining the army. Similarly for the “most Ukrainian” of Western Ukrainian relatives Mansky visits, his uncle Volya, who – together with his wife – mostly share memories of better times rather than their views of the conflict. The fact that the images Mansky captures occasionally turn out to be resistant to his narrative, does not in itself make Close Relations a good model for objectivity. What must be distinguished in this context is Mansky’s professed aim to hear out the other side, and his actual ability to do so in a non-subjective way. True, the very fact that Mansky genuinely tries to reach out to the view of the pro-Russian side of his family in the later sequences is more than can be said of most accounts of the conflict, and it is thus not far-fetched to say that Close Relations does fare far better than most commentators in incorporating both sides of the story. But how much does that amount to in a conflict constituted by a complete lack of mutual recognition? And is it really worse – as some commentators have suggested – to openly profess one’s subjective view in a film, as say Sergei Loznitsa has done with his recent feature Donbass?3 Does not the danger lay in pretending to be an observer when you are involved in the conflict in multiple and highly personal ways? The real thematic congestion around Ukraine in crisis comes with Aunt Tamara’s family back in Lviv around 30 minutes into the film. (As a timeline that precedes each of the sequences reveals, Mansky traveled back and forth from Western and Central Ukraine, making several stops in Lviv.) Tamara lives in a multi-generational household with her mother-in-law, her daughter Anya, both women’s unemployed husbands, and Anya’s son. Not counting the laconic men, who hardly speak a word during the entire 15-minute-sequence, the family members incessantly meditate over politics and Russia’s cultural and political influence in Ukraine more generally. All three women in the household starkly oppose Russia’s claim to Ukraine’s territory. Critically reflecting on the city’s multi-ethnic history, Tamara argues that people finally want some “stability”. Worryingly enough, she even cites the difficult time she had integrating into Ukrainian society as a Russian speaker while arguing for the need to force a common identity onto people. In spite of such evident absorption with political matters, it is in Tamara’s household that Close Relations finally starts to resemble a family portrait. Not that Mansky’s subjectivity is explicitly affirmed. That never happens, at least not in any meaningful way. But by taking his time to film the different family members – including great-uncle Tolik, who calmly listens to the conversations, occasionally laughing at a remark – in their living familial environment, the narrative loses some of its political survey character. We catch glimpses of the family’s daily routine: Anya tends to a customer, her son sits at the computer while being caressed by his grandmother (cautiously, as is advisable when dealing with a teenager), and Tolik sits on his favorite spot silently enjoying his company with a cigarette in his hands. This makes even the more problematic views of Tamara more relatable, because they are shared in the environment where she is also a human being, a mother, and a grandmother. Admittedly, Mansky tries to carry over his sensibility for the everyday persona as he visits Crimea in January 2015 (that is almost a year after he had started filming). We briefly see his aunt Natasha exercising with a hula-hoop, and she speaks to Mansky about politics and identity from the familiarity of her kitchen. Still, it is here, on the other side of the conflict, that the pitfalls of partisan portrayal become fully manifest. At the point that Mansky was visiting, Crimea had already been annexed by Russia, meaning that his local relatives suddenly “woke up” in another country, as Mansky puts it. His aunt Natasha welcomes the situation, citing the dark times when she was barked at for speaking in Russian after Ukraine gained independence. (This is especially noteworthy because large parts of Ukraine are predominantly Russophone, even those clearly oriented towards the West.) Here again Mansky must be credited for letting Natasha speak her mind. But one can’t help but notice that Russia’s illegitimate presence is very much at the forefront of Mansky’s interest – and, crucially, more so than in Lviv or Odessa, where we also watch newlyweds descending the stairs where Battleship Potemkin was shot, or women talking about their manicure. The Crimea sequence, by contrast, opens with a propagandistic news reel that cites the happy days of the unanimous referendum, and with shots of Russian flags hanging over the cityscape. On New Year’s Eve, we get to see Putin himself greeting Crimeans in a televised address that is screened on a central square in Sevastopol as Natasha watches, visibly touched. After Mansky shortly shows images of his mother’s birthday following the Crimea segment, who again proves her ability to stand above political categories by simply wishing for and end to war and for her family’s safety, Mansky visits Eastern Ukraine. The very fact that Mansky dared to enter the so-called Donetsk People’s Republic is remarkable in itself, and so are the shots he captured. Also, unlike in Crimea, the omnipresence of politics does not come off as tendentious, because we see soldiers walking through the shot even during shots of public parks and streets. (This is not to say that people’s everyday lives are fully structured around politics. But it is at least plausible to assume that politics always linger in the corner, that they would be difficult to overlook as a visitor from abroad.) There is, again, glimpses of everyday life – a chat in the kitchen about grandfather Misha’s personal story, and a shot of him being tended to. And then, this other side gets to tell their story, meaning having grandfather Misha repeat Russian propaganda, which ramblings about evil Ukraine and glorious Russia are subsequently beginning to be intercut with footage of Misha consuming that very propaganda on television. Consume and share. This is the objectivity we were promised: pro-Ukrainian accounts of the country’s cultural and political history and consequent right of self-determination are contrasted with the recital of superficial political slogans. As if grandfather Misha’s opinions were not informed by his personal experiences and the historical connection he feels to Russia just as the family’s stance in Western Ukraine is shaped by their lives and history. To set the record straight, I am not in any way calling into question that Russia is aggravating and instrumentalizing this conflict, nor that Putin’s words are propaganda of the lowest kind. (Indeed, not even the promise to help Donetsk economically is credible.7) My point is rather that the local people’s perspective is not acknowledged by associating it with either of those facts. Grandfather Misha may be framing his allegiance to Russia in ludicrous terms provided by regime-friendly TV stations, but that does not mean that Donetsk residents of his age are drawn to Ukraine’s neighbor because of propaganda. Here not only the deep-rooted cultural ties of Eastern Ukraine to Russia must be mentioned: Eastern Ukraine was part of Tsarist Russia and the Soviet Union for much longer than the Western parts, neither of which encouraged Ukrainian nationalism (including the cultivation of Ukrainian language and culture) quite as much as the Austrians did in Western Ukraine (if for purely political reasons). The Soviet Union also encouraged, both ideologically and in practice, internationalism on the on the one hand, and, on the other, an understanding of mobile borders within the Soviet Union which were repeatedly being renegotiated along and often despite ethnic fault lines. Misha’s generation did not grow up with the strong sense of national identity that is now sweeping across the young post-Soviet states, nor with a sense that what belongs to one (post-)Soviet republic must forever stay in its hands (after all, in theory, it mattered only symbolically whether one region belonged to the Russian SSR or the Ukrainian SSR). That means that retelling his understanding of why Russia’s role in the region is welcome should factor in a specific cultural context, as was done when Tamara pointed out Austrian and Polish influence in Lviv. Of course, this being a family portrait, Mansky could not literally chose what his interviewees would share with him. But if you are making a film about a divided country and try to acknowledge both sides of the conflict, you better make sure to have both sides be properly represented. The irony is that the arcane argument about subjectivity this article tries to provide, is only necessary because I am (largely) addressing a Western readership, and because I consider myself to be speaking from a (again only largely) Western perspective. I am sure that any viewer watching “from the other side” would need no hints why Mansky’s film is tendentious, but immediately feel offended by its lopsided reporting. – Why the incriminating epilogue featuring views of pictures and flowers laid down in Boris Nemtsov’s memory? What does that have to do with Misha’s and Natasha’s feelings towards Russia, or their history and personal experiences? Why the trip to Viktor Yanukovitch’s former residence? And why do we not follow the people of Donetsk and Crimea as they make dinner, celebrate, and sail boats? Do people in Crimea not have boats, and children they love? Finally, are pro-Russian civilians not entitled to their opinions? For all we know, Vitaly Mansky approached this project with the best intentions, and there is no reason to suspect that he intentionally wanted to paint contrasting pictures of Western and Eastern Ukraine. As for boats and children, the circumstances under which he filmed that part of the country will have been difficult enough as they were. My issue is not with Mansky, or his film, though I do think he was naïve in thinking he could step out of the frame in a film about his family and warring homeland. (The fact that he could not go through with that aim in all shots despite having tried, is a fitting metaphor for the film’s unacknowledged subjectivity.) My main problem is with our treating this so very subjective and prejudiced film as a beacon of objectivity. Has our imagination truly become so biased that we take the personal musings of a multiply prepossessed director to be our model of objectivity? If so, we should not hope to be building bridges between East and West any time soon. 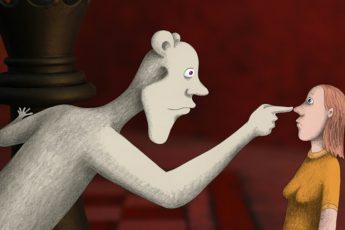 For reviews stressing Mansky’s nuance concerning the acknowledgment of both sides of the conflitct, see reviews by Carmen Gray for Cineuropa (https://cineuropa.org/en/newsdetail/326792/), by Pat Mullen for POV Magazine (https://thefilmstage.com/reviews/review-close-relations-is-an-uneven-powerful-statement-about-ukraine/), by Ryan Swen for the Film Stage (https://thefilmstage.com/reviews/review-close-relations-is-an-uneven-powerful-statement-about-ukraine/), and by Kristina Tarasova for Reeling the Reel (https://reelingthereal.com/2016/10/24/film-review-rodnye-close-relations-vitaly-mansky-2016/). All reviews accessed on the 21st of January 2019. Eric Hynes, Interview with Vitaly Mansky (Film Comment). https://www.filmcomment.com/blog/interview-vitaly-mansky/. Accessed on January 21st, 2019. For instance, Carmen Gray criticizes Loznitsa for his one-sided portrait of the Ukrainian crisis in “Donbass” while lauding Mansky for his nuanced reporting (cf. fn. 1). http://sensesofcinema.com/2018/festival-reports/reality-as-embattled-story-donbass-in-odesa-and-their-own-republic-at-doclisboa/. Accessed on the 21st of January 2019. I omit discussing the scenes featuring Natasha’s son because the overbearing presence of television prevents him and his family from engaging in meaningful communication. While it may be argued that these scenes add some of the everyday angle to the Crimean sequence whose lack I am after all lamenting, I would still draw a stark contrast to the portrait of Tamara’s family in that we are not here witnessing truly human interactions. The television may be on in pretty much every sequence of the film, but in the case of Natasha’s son even to speak of triangulation would be an understatement – essentially, the TV is the main agent in the family conversations as we witness them. The superficial justification provided by the film is that Mansky’s brother-in-law, who accompanies Mansky during his visit, has recently moved to Kiyv. You may be wondering if, by constantly referring to the “other side”, I myself am dramatizing the schism between Eastern and Western Ukraine. The fact of the matter is that there is no way of discussing Mansky’s film but with the help of those categories as they consume his reporting on the crisis and his family. Brian Milakovsky, “Cut Off: What Does the Economic Blockade of the Seperatist Territorist Mean for Ukraine?” (WilsonCenter). https://www.wilsoncenter.org/blog-post/cut-what-does-the-economic-blockade-the-separatist-territories-mean-for-ukraine. Accessed on the 21st of January 2019. A very thorough observation with conclusive critic. Great!